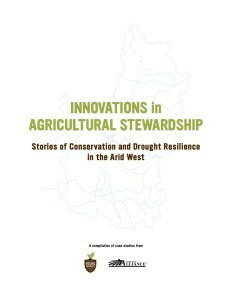 The National Young Farmers Coalition (NYFC) partnered with the Family Farms Alliance to create Innovations in Agricultural Stewardship: Stories of Conservation and Drought Resilience in the Arid West, a report featuring five case studies, with analysis of the balance of water usage around the year at three operations. Released in May, the report is “an effort to elevate the voices of farmers and ranchers,” says Kate Greenburg, Western Organizer at the NYFC and co-author of Innovations in Agricultural Stewardship. The report also aims to show “the nuances of western water and how we really need policy that is nuanced and involves farmers and ranchers in shaping it.” Both the NYFC and the Family Farms Alliance are advocacy groups for independent farmers and ranchers. The document focuses mostly on the Colorado River Basin, a region that provides water to 25 million people in seven U.S. and two Mexican states, with agriculture being one of the main uses for the available water. Like the rest of the west, the Colorado River basin has experienced unprecedented drought in the past 14 years. This year, the snowpack that provides water for California was just 5% of its usual level, and snowpack that feeds into the Colorado River system was also well below normal. The farmers and ranchers featured range from multi-generation family farms to first generation growers figuring out the ropes as they go along. The farms are located along the headwaters of the Colorado River, in the Upper Basin and in one case, in California. With no end to the drought in site, Innovations in Agricultural Stewardship focuses on “pointing a way forward,” according to Kate Greenburg, Western Organizer at the NYFC and co-author of the report. The report highlights improvements that farmers and ranchers have made to decrease water usage, namely by careful choices of irrigation technology and soil management techniques like cover-cropping, rotational grazing, no-till farming and mulching. These choices not only increase farms’ resilience to drought conditions, but also balance the necessity of maintaining yield and the importance of wildlife, ecosystem services and community health. Other producers sometimes use inefficient irrigation methods due to the prohibitive costs of switching to a new system. “Not every practice is suitable for every farm but every farm can think about their operations in the whole,” says Greenburg. Greenburg outlines a historical pattern in which rapidly growing cities buy water rights from agricultural land, leading the land to go out of production. “Southeast Colorado is a really pertinent example where that happened,” she says. “Now the land is completely unproductive and only grows tumbleweed.” Greenburg voices concern that the continuation of this trend will not only lead to less western farmland being in production, but will also limit young farmers’ access to arable land as water for agriculture becomes less available. She notes that less farmland in the west would also mean less local food. “We certainly hope that the case studies will help educate policymakers on the diversity of western agriculture” and that they craft policy that emphasizes sustainable agriculture, soil health and water conservation, and incentivizes farmers and ranchers who follow those practices.